Make the most of your Salesforce data. Why Should I Manage Events in Salesforce? An event management system within Salesforce allows you to access all relevant data in one centralized location—your database! You’ll be able to manage all event-related tasks without leaving Salesforce, providing you a seamless, comprehensive event-planning experience. How Can I Manage Events in Salesforce? To manage all event data in one place, you’ll need to work with a compatible Salesforce event management app. These platforms work together to create a holistic view of your event and constituent data, with event-planning features such as guest management, analytics, and marketing. What Type of Event Management App Should I Use? When choosing your Salesforce event management app, search for software that can run as effectively as possible within your CRM. Using a Salesforce native app means seamless data transfer, always up-to-date information, and no manual data entry. Learn how your organization can stop manually migrating data into Salesforce. An application that’s native to Salesforce is one that was built to reside within the Salesforce system exclusively. That means that all the data stored within your Salesforce CRM will automatically connect to your event management app. Additionally, because your event management software is interconnected with Salesforce, you won’t have to worry about third-party servers, data storage, or integration. Everything you need will already exist within your database. A non-native Salesforce app should still work when integrated with your CRM, but the relationship between your database and event management app will be somewhat more complicated. A app that isn’t native exists outside the Salesforce system, with its own functionality, data storage, and server. You’ll have to work with a third party provider to connect the two platforms, and you’ll be responsible for keeping your Salesforce database up-to-date with your event information (and vice versa). Check out Fonteva Events, a native Salesforce app! To get the most comprehensive event management experience, find software that works directly with your Salesforce database. The only surefire way to guarantee compatibility? Find an event management app that’s native to Salesforce! Your software will always be synced with your complete data set, no manual transfer required. Like any other software, it’s important that you ensure your event management platform fits within your organization’s budget. In addition to the initial price tag, keep other costs in mind, such as payment processing frees, training expenses, or other service fees you might incur later on. Though mobile optimization is almost a given in today’s world, you should check that your software creates mobile-friendly registration forms, event sites, and more. Your guests should be able to retrieve any necessary event information through their smartphones, giving them hands-on access to your event at any time! Cloud-based platforms don’t require any hardware; all you need is a WiFi connection and your event management solution is up and running. When you can access your event management software wirelessly, you’ll be able to stay on top of your event no matter where in the world you are! See more key features of Salesforce event apps! If your event offers multiple tracks or sessions, you can use your Salesforce event management app to ensure that guests can easily register for exactly what they want—nothing more, and certainly nothing less! For example, if you’re a university offering multi-session courses, your app can enable students to register for all events within the series at one time. Planning conferences is no problem with an intuitive Salesforce event management app. You can use your app to schedule speakers, vendors, and exhibitors for your conference. Then, allow your guests to manage their schedules depending on which tracks or sessions appeal to them. You can use your Salesforce event management app to segment your database and design the most strategic guest list for your event. You can send out invitations to specific individuals or a designated list and then file your received RSVPs within your database. With a Salesforce app, you can customize your invitation process without risking losing data! If you’re offering training courses to your students, staff, or supporters, you can manage registrations within your database. Guests can sign up for a one-time session, certain events within a series, or an entire sequence at once. Fundraising events are an engaging, profitable way to raise money for nonprofits, universities, churches, and other organizations. When you plan your fundraisers within your Salesforce CRM, you’ll automatically have access to all the data you need to plan an event that appeals to supporters. Your event management software should help you keep track of every aspect of the event-planning process. Being able to manage the event experience for guests is equally vital to a good event management platform. Some event management solutions can generate dedicated webpages (or micro-sites) to serve as the hub for all things related to your event. A micro-site is ideal for promoting your event, since you can post all relevant event information in one location and accept registrations or sell tickets, too. Don’t forget to include an eStore to sell merchandise or other items! You can use your Salesforce app to build registration forms that are perfectly tailored to your upcoming event and customized for different types of guests. When you include your registration forms on your event micro-site as well as your organization’s website and social media pages, you’ll attract guests and inspire registrations! Before the event starts, you can use your event management app to issue surveys and collect valuable insight from your constituents. Then, use that data (filed neatly in your Salesforce CRM!) to inform your planning strategies or simply compare it to post-event survey data to see how your event measured up to expectations. Keep guests on track throughout your event by communicating with them via text message! You can send out important event info (such as updated scheduling or cancellations), promote upcoming sessions or speakers, or remind guests where the main attractions are taking place. Individuals can use your custom-built registration forms to register for a one-time event, such as a fundraiser, member engagement event, or single-session course. You can set up flexible registration options for series of events (such as course registration) so that attendees can quickly sign up for all subsequent sessions at one time. If you’re planning a multi-session or multi-track event (such as a conference), you can give guests the ability to choose exactly which events they’d like to attend. Then, they’ll be able to view their full event agenda to stay on top of the sessions they’ve selected. You can give guests the option to register in groups so that all attendee data and payment information is collected at once. Groups can sign up for sessions collectively or individually, depending on their preferences. You can offer a single general admission price point for all your guests or set a standard general admission price for registrants who don’t fit into another pricing category. Make sure that your general admission pricing is affordable so that it can appeal to a number of guests. You can offer discounted VIP pricing for early registrants or major donors, or as part of a membership package. Offering a VIP price to constituents who’ve already demonstrated their support for your organizations will reiterate how much you value them—and serve as an incentive to attend the event! You can segment your guest list to offer special pricing for individuals or specific groups. For example, if a constituent has recently made a large donation to your organization, you don’t want to disrespect them by asking them to pay full price for a ticket. Instead, send them a personal communication with an exclusive offer just for them. If you want to create completely customized pricing levels, your Salesforce data can help. You can use constituents’ giving histories to determine appropriate pricing and then send individual registration forms that correspond with each individual’s personal ticket price. When the price is tailor-made for each guest, you’ll almost guarantee an excited RSVP! Learn the 5 best ways to optimize your Salesforce event registration! Since you’ll be able to accept registration payments (as well as eCommerce transactions and additional donations) within your event management app, you’ll need to make sure your platform adheres to all payment processing standards. Your payment processor should maintain PCI compliance and have necessary fraud prevention tools in place to ensure your donors’ security. Engage with guests throughout the event to let them know your team is excited they’re attending! With guests’ preferences in mind, you can send targeted communications via email or even text message. Send guests updates on what’s next in their schedule, encourage them to share their event experiences on social media, or ask for feedback on specific sessions. Sending a guest survey before the event can help you gauge attendee expectations, preferences, and goals. If you send your survey early enough, you can use that data to plan an event in line with your audience’s objectives. Additionally, you can send out post-event surveys to see how their expectations lined up with the event reality! Take a comprehensive look at your event’s success by compiling reports on any metric you choose. Your event management software should enable you to sort and view data in a way that helps you analyze your performance and determine what aspects of your event worked well and which fell short. That way, you can know exactly where to start for your next event! Now that you understand the basics of Salesforce event management, it’s time to dive into your own event! Follow our guide to plan the perfect event with your event management app. Get Started Planning Your Salesforce Event! Whether you’re managing events, optimizing operations, or engaging with customers, these apps can help! Check out our reviews of the best Salesforce apps on the market. See Why These Salesforce Apps Stand Out! A native Salesforce app can help your organization plan events in a more effective way. We’ll walk you through what it means to be Salesforce native so you can make the best event app selection. Learn Why You Need a Native Salesforce App! With a whole list of tools available, why settle? This list will take you through the top event management tools on the market so you can find the right solution for your team. 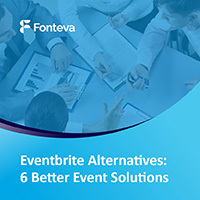 Discover 6 Amazing Eventbrite Alternatives!